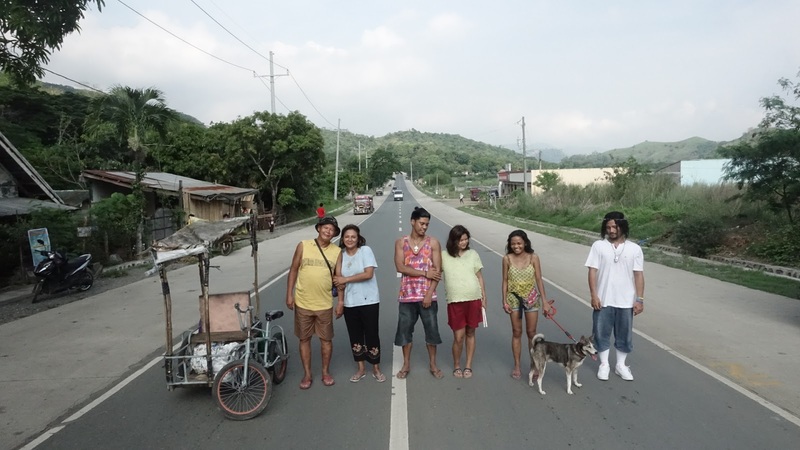 In 2003, a family was featured in a leading newspaper as they dramatically attempted to “pedal their way back home to Leyte” – this inspiration prompted filmmaker Paolo Villaluna to write a screenplay, and this film material was further strengthened by having been a daily eyewitness to another indigent family living off in a pedicab just right in front of his much comfortable house. For years, Pauwi Na would be shopped around without much luck, until it reached the selection committee of the first ever ToFarm Film Festival just a year ago. Though not strictly fashioned in the filmmaking style of the “found story” discipline, the result would still become a keenly-observed moving portrait of the realities and struggles of the urban poor; while still serving a visually elegant feature presentation that exposes Villaluna’s sober maturity as an accomplished filmmaker. While locally produced poverty films may have had its commencement in as early as Lamberto Avellana's Anak Dalita and then further underscored in most of Lino Brocka's bulk of filmography, perhaps the one that unabashedly "spearheaded" the kind of abjection to the extremes was the 1992 BBC film Lucia (Chionglo/Brocka). It was the story of a family originally living in a fishing village but had to migrate to the city after the aquatic provisions they depended on was permanently doomed by an oil spill accident. Lucia's family had to endure being relocated from one shantytown after another, eventually suffering the tragic consequences of urban poverty and diaspora. Paolo Villaluna's Pauwi Na is quite the parallel opposite, at least course-wise. His version of a family decides to leave the city, virtually on foot, to settle back permanently to an undisclosed province. Like Lucia’s family, there is nothing much to survive on where they live, making retro-migration commonsensical as a decision. While Villaluna's film crossed the same narrative route as Chionglo's, the former treads lightly to make the foreseeably harsh realities more tragicomic in orientation, if not customarily flat out dramatic. The result is a black comedy that pushes the bittersweet human errors and relishing them with elements of fantasy. It also validly nets the awkward laughs and tucks the middleclass disgusts in a rotund plane, while making a temperate case for social critique. Trust Villaluna and perennial co-writer/producer Ellen Ramos' marked visual command; one would trace here a throwback as painterly formative as Ilusyon (2005) and as gracefully poetic as Walang Hanggang Paalam (2009). Pauwi Na is a sweeping road film – the kind that has no turning back for a sickly father (Bembol Roco), a worn-out mother (Cherry Pie Picache), and their troubled grown children (Chai Fonacier and Jerald Napoles). As they go along, it appears that each stopover has its own episode of adversity that needs to be hurdled if their journey must carry on. With a rock star Jesus Christ (Jess Mendoza) as one of the supporting characters among this motley crew of family travelers, what could ever go wrong? Except, His Almighty as depicted can only do so much: he just gives flashes of “bumper sticker advice” and “words of wisdom” to the only person in the group who can see his supposedly Holy Image – a blind pregnant woman (Meryl Soriano) – whilst in between puffs of his favorite cigarette brand. Maybe their quandaries seemingly go beyond redemption. First, the only mode of transportation they can afford is a whipped cycle rickshaw (pedicab in our parlance). Second, their destination is an unnamed province up north (or south), along which they have to negotiate their safety and ease through a treacherous superhighway. In-between, they have to do road stops to fetch some drinking water, relieve the call of nature, and in most cases, boil whatever food they have left or mustered for sustenance. Tagged along is a loyal pet dog that is also as ghastly imposing of nourishment itself. Finally, the man of the house, err… the road… has a wheezing cough as wicked as Liz Lemons’. And somewhere in his soiled belongings, a stash of unscrupulously gotten cash is safely tucked in. Sweeping statement aside, Pauwi Na is one of the best Asian films of the last 20 years. (I can’t be more convinced that there are other films of their own merit that supplement their creative wealth more on the afterthought, and the weight of its effects depends on the audience’s perceptions and interpretations.) At the end, we have been schooled without going through the usual trappings of didactics; we have shared its vision sans the inanities of artistic executions. It’s a well-rounded film that evenly reflects the ills of the society by being more physically demonstrative than expository in nature. Propelled by solid and affecting ensemble performances, it sympathetically examines poverty on its feet without so much reverence to the projected narrative style. Pauwi Na carefully veers away from the melodramatic territories of human sufferings. Watching it gives a certain feel that Italian Neorealism has been given a postmodern update without turning its back to what makes its own set realities more spiritually accessed. In effect, Villaluna elects directorial subtleties to offer a rolling account that is more heartrendingly felt than ostensibly professed. On top of the visual splendors its somewhat ironically polished camerawork presents, the film deeply progresses from being oddly entertaining to becoming what is inescapably and evidently shattering. Impressively, Villaluna puts his judgment on the back burner and exemplifies an earnestly faint depiction of the displaced. And such might be the case for his precisely drawn characters, the filmmakers rollick them on some guilt-free entertainment fare by employing a curious editing device: periodically, we droll in the black and white slo-mo tableau where we see them lavishing in material wealth as if expressing their feelings towards socioeconomic class differences, urban decay, and blind faith without the use of words or spray-painted walls. It also makes inquiring of the film’s third act seemingly contentious when some of them would meet their journey’s end while temporarily boarded inside a fostering church. This reflection makes the film, overall, inimitably evocative but with socially-informed restraint. Pauwi Na will be shown in over 65 theaters nationwide starting tomorrow, August 16.